Do you know what our luscious locks are made of? Our hair, just like our fingernails, toenails and skin, is made of a tough protein called Keratin. It is the same protein animals’ horns, hooves, claws, feathers & beaks are made of. Hair keratin is formed by amino acid molecules that come from the protein within our diet. Keratin treatments are hugely beneficial for both the look and feel of you hair. We could list so many benefits of these treatments, but today we’ll leave you with just 4. Keratin gives your hair strength, elasticity and can withstand both extremely low and high temperatures if you have enough Keratin in your hair. Regular heat styling can damage the bonding between the keratin structure, leading to breakage and damage. Which is exactly why it’s so important to not only incorporate protein into our diet, but also to apply Keratin directly to your hair. Which is where we come in! Studies show that people who use keratin on their hair have smoother, easier-to-manage hair. Keratin works by smoothing down the cells that overlap to form your hair strands. The layers of cells, called the hair cuticle, theoretically absorb the keratin, resulting in hair that looks full and glossy. Keratin also makes curly hair less frizzy, easier to style, and straighter in appearance. Keratin treatment can be applied on natural or chemically treated hair. If you’re thinking about getting a colour done, it seems best to do so before you treat your hair with keratin. The reason for this, is that the moment keratin is sealed on your hair, the colour that had been applied on your hair previously is sealed effectively. The keratin you’ll get from the treatment also prevents the colour from fading. Think of it as an added bonus! Keratin provides an extra layer of protection and the conditioning your hair might need if it’s been damaged by chemical treatment or product build-up. Keratin also works to replenish the hair during specific seasons and conditions when it prone to be extra dry. Maintaining the health of your hair helps prevent split ends and breakage, by giving it an extra boost of moisture. These keratin oil benefits are especially helpful if you want your hair to grow. 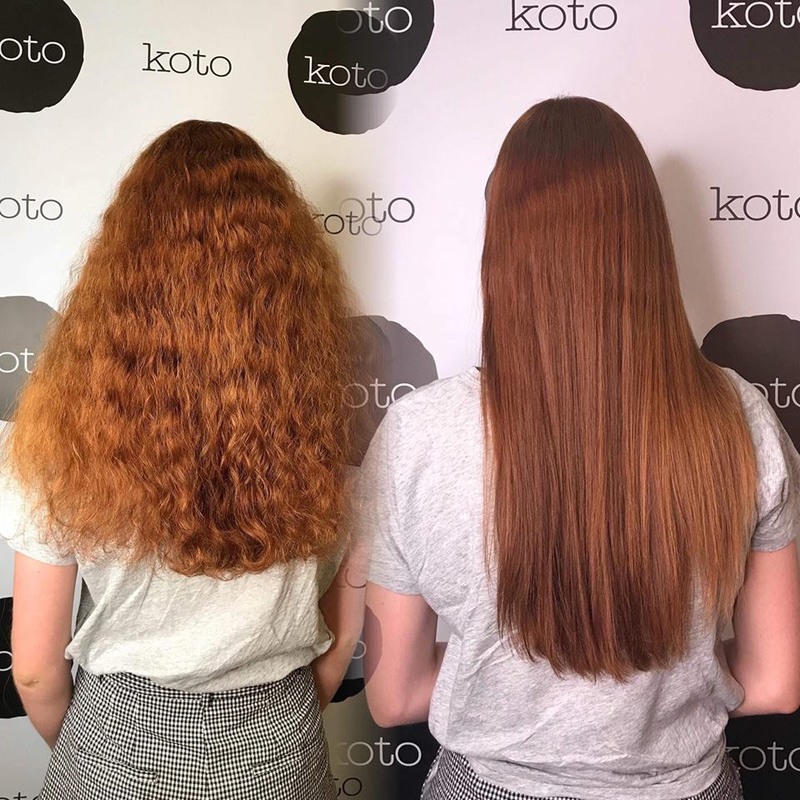 At Koto we embrace the individual in each of us and combine it with cutting edge trends, expert skill and left-brain creativity to produce what we believe is an inimitable salon experience. Book in your Keratin treatment today and say goodbye to frizz & damage and hello to smooth, healthy locks!